Search engines don’t like broken links because they think that you are not maintaining your website. Going back and correcting these links is good website maintenance. How do you find broken links? There are several tools out on the market as well as you can set up Google Webmaster Tools and it will tell you. I’ve used Xenu for PCs and Integrity for Macs. Once they have done a scan of the website, they will give you the page and the link that is broken. Usually you will get a download into an Excel file. Just go into your CMS and fix the links. Just go into the CMS and correct the link. Do you have a favorite tool for checking your links? When adding images to your website, there are several things you should think about doing to make sure that the search engines understand what you are putting on the web. 1. Put keywords in the image file name. 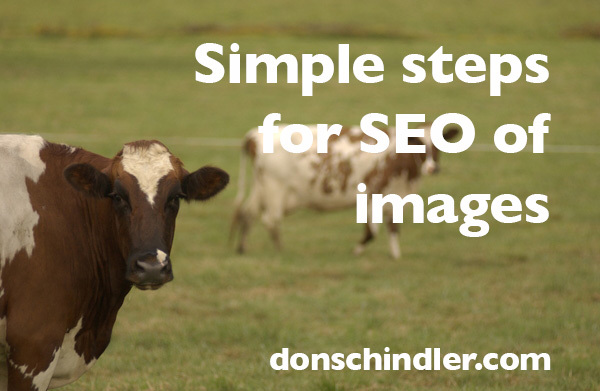 Instead of the image being named IMG_7657.jpg, rename the image before uploading to your website like cow-in-field.jpg. 2. Make sure to use Alt Text and Title Text and it doesn’t hurt to add a caption with the image. 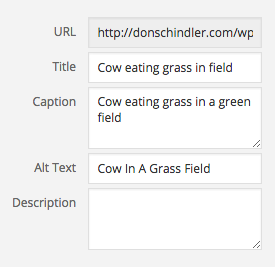 Instead of just placing the image, you should put in <img alt=“Cow In A Grass Field” title=“Cow eating grass in field”></im>. Then add a caption of “Cow eating grass in a green field”. All of this helps the search engine to index the image properly. Tip: It’s better to properly size the image for the website as well as reduce the file size as much as possible when putting images on the web. Several photo editors I like are Canva, Picmonkey and on my phone, I’m a fan of Word Swag.